Last June, seven fellows purporting to be world leaders, flanked by minions and carpetbaggers, teamed up in Bavaria to debate major issues, like international security, development policy, environment, poverty-related diseases, and trade agreements. Greek bailout and Ukrainian mess were on schedule as well. The MSM were fully engrossed in the event, but they dodged any query about who funded/trained ISIS? who’s responsible for the Greek debt? They raised no objections to postpone climate change debate to the Paris summit next December and maintain the secrecy over TTIP (Transatlantic Trade and Investment Partnership) – after all, didn’t Cameron assure it’s a good deal? The corporate media were committed on parroting the drivel of Obama and his lackeys about sham Russian invasion of Ukraine, and Russia’s support for Donbass separatists, which, along with Russia’s annexation of Crimea, aka popular referendum, led to Russia’s exclusion from the summit. The parroting was brought to such an extent that it seemed the leaders had anything but Russia’s absence to talk about. Sanctions based on unproven but repeatedly disproved NATO’s allegations, despite being harmful to European economy, were extended on June 19 by the Council of the EU. The West’s punitive isolation of Russia went ahead! One month later, from July 8 to 10, the overlapped meetings of BRICS, SCO and EEU took place in the Southern Urals city of Ufa, under Russian chairmanship. BRICS originated at 2005 Saint Petersburg Forum by a process based on the objective need for cooperation under more democratic principles for global economy. Including Brazil, Russia, India, China and South Africa, it covers 26% of the world’s land territory, rich with extensive natural resources, comprises 42% of the world’s population, and produces 27% of the world’s GDP. SCO (Shanghai Cooperation Organization) includes China, Kazakhstan, Kyrgyzstan, Russia, Tajikistan, Uzbekistan (counting 1.6 billion people and $11.6 trillion in GDP) and at the summit was launched the procedure granting India and Pakistan full members status – thus, finally aligned in mutual interest after about 70 years of misbegotten Anglo-American geopolitics. Belarus and Iran, currently observer states along with Afghanistan and Mongolia, are to join in the future. Armenia, Azerbaijan, Cambodia, and Nepal got accepted as dialogue partners, therefore raising to the rank of Sri Lanka and, more problematically, Turkey – being this one a NATO member. Bangladesh, Egypt, Syria, and the Maldives asked to join in different capacities. The isolated Russia is a common member to each of these strategic partnerships, which affect politics, economy, finance, humanitarian cooperation, diplomacy, and defense. In Ufa, Russia and China spearheaded several initiatives of integration. A major accomplishment was the launch of the NDB (New Development Bank), designed as an alternative to international hard currency financial institutions. Within the end of the year, NDB will consider the feasibility of infrastructure projects such as large-scale transport, energy supply, and industrial development, with the first loan expected to be approved by April 2016. Member countries have their own strategic prospect of development and Russia ranks as the most attractive market. China is ready to invest in all sectors of the Russian economy, as it sees acceleration in growth. Brazil, India, Thailand, and South Africa are to enhance commercial relations with Russia, focusing on agribusiness, fishery products, crude and refined oil, petroleum gas, and semi-finished iron. Russian Railways have major projects in Brazil, and along with Rosneft in India as well. A Russian-Chinese joint venture is scheduled to build a gas pipeline across Mongolia. All projects and trades will be financed in domestic currencies. The NDB and China-led AIIB (Asian Infrastructure Investment Bank) are to end the monopoly of the Bretton Woods system, formed by the IMF and World Bank, which has benefited U.S. policy so far. The Federal Reserve rules over interest rates and U.S. dollar printing, thus it impacts on exchange rates, and eventually on transaction costs of every country since international trade takes place in U.S. dollar. As it’s being phased out, post-1945 global order steps back to make room to a multipolar world anchored on the Eurasian bloc. Unfortunately, there’s little chance that this process will be accomplished peacefully. For decades, the U.S. has used NATO as its armed wing to prop up the value of the dollar, thus securing the interests of the International Banking Cartel (IBC). The Federal Reserve serves as a supervisory authority for this banking oligarchy, which holds nearly every corporation, including the major oil and gas companies Exxon Mobil, Royal Dutch Shell, British Petroleum, and Chevron Texaco. The IBC is represented by the Financial Stability Board (FSB), an international body emerged from the Financial Stability Forum, a group founded in 1999 and consisting of Finance Ministers and Central Bank Governors of the G7 countries, along with few other institutions. The FSB’s agenda prioritizes the strengthening of the financial system and stability of international financial markets. Essentially, this means it draws up ploys to keep those very countries at an advantageous position and make things difficult to emerging economies. Whenever its interests are threatened, the IBC calls upon NATO intervention – usually under the pretext of ‘exporting democracy and liberal values’. The dollar dominance underpins U.S. financial supremacy and a boundless spending power that allows it to deploy troops all over the world. Military global presence in turn secures dollar hegemony. In November 2000, Saddam Hussein declared that the dollar was the ‘currency of the enemy’ and that Iraq would no longer accept it for oil transactions. By 2002, Iraqi oil was being traded in Euro. Sanctions and an invasion followed. Libyan leader Muammar Gaddafi was committed to the foundation of three major banks in Africa: the African Monetary Fund to replace the IMF for African countries; an Investment Bank to control most of the investment; a Central Bank to print a new currency to dump the dollar in the trade of oil and other resources. This would have given the oil-rich countries of Africa and Mideast a huge power over the Western energy-hungry customers. In March 2011, NATO established a no-fly zone throughout Libya and started bombing Gaddafi’s forces – according to President Obama, the goal was saving lives. Seven months later, after an extended military campaign with sustained Western support, terrorist forces conquered the country and eliminated Gaddafi. Since then, Libya’s turned into a favorite among terrorist groups. Russia, China, and India share a geographic merging point in Central Asia and Mideast, areas which consequently might experience unprecedented development. Therefore, stability is of the utmost importance. Since 2010, way too many countries have been subject to alien maneuvering aimed at regime change – after North Africa and Ukraine, even Kyrgyzstan and Armenia were targets of U.S.-sponsored color revolutions. BRICS agreed on the need to preserve Libya’s sovereignty and territorial integrity, and its final declaration advocated a joint action to deal with member states’ inner security problems, as well as tackle terrorism and extremism. Notably, one specific section referred to Afghanistan. It appealed on the armed opposition to disarm, accept the constitution, and cut ties with Al-Qaeda and ISIS. On July 14, once again due to extensive Russian involvement, a final agreement on Iran nuclear program was reached in Vienna and UN sanctions were finally lifted – Iran, owner of zero nuclear heads, negotiated with countries having 16.335 nuclear heads overall. Moreover, Russia and China, loath to commit to U.S.-led sanctions system, had already anticipated a resumption of trade with Iran before any agreement was reached. On their wake, corporations and other governments would do likewise, thereby making sanctions ineffective. Iran has long requested that its status be upgraded to a full SCO member, and now the accession process may begin. In Ufa, Russia proposed a roadmap of about 50 projects for investment cooperation, including the creation of an energy association within the bloc, an international energy research center, and an industry union. Clearly, trade is bound to increase on energy front, and Iran will be back as a competitor in major oil markets such as China, Japan, Turkey and West Europe, pledging to reassert its power. Injecting new oil to the world markets could impact price, currently driven down by a glut of supply. Prices depend on global economy at large. Adequate demand would ensure a minimal impact, otherwise a further fall in oil price would turn U.S. shale into a non cost-effective investment, thus resulting U.S. energy exports in recession. In February, Iran’s chief regional ally Syria also submitted an accession request to SCO membership. Incorporate Syria might likely lead to the Eurasian bloc supporting Assad in its war against ISIS, the proxy rebels brought into being by U.S. and Israeli intelligence and backed by Saudi Arabia, Qatar, and Turkey. Thus far, only Russia and Iran have offered substantial help to Damascus, but on June, President Putin suggested the creation of an international military coalition. Obama administration refused to back Egypt’s attacks on ISIS (and Egypt also attended the SCO summit), and it funded jihadists in Syria to overthrow Assad. U.S. foreign entanglements in North Africa and Mideast – where Syria and Iran remain the sole countries without NATO bases – are meant to create a caliphate that centers around scooping up all the most important gas lines. To prevent Ukraine from joining EEU and take over the gas sale to Europe, the Obama administration plunged it into civil war by backing a Nazi-led putsch. Such turmoil is being used now as a pretext to send troops and armour to Ukraine, as well as ISIS is a pretext to incrementally occupy Syria. The attempts in isolating Cuba and Iran, both refusing to bow to Washington’s threats, ended with U.S. officials to sit down at the negotiating table with both the Iranians and Cubans. 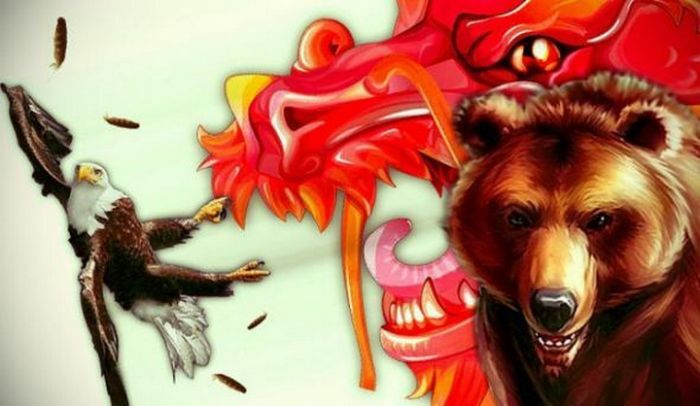 U.S. policy in Ukraine has merely succeeded in pushing Russia quickly closer to China and consolidate a Eurasian bloc, now making strides to assemble a military coalition that will include four countries with nuclear weapons. Participants in the Ufa summit have had enough of NATO destabilize-and-invade strategy, enough of Wall Street rule, enough of U.S. meddling and lecturing in other countries’ internal affairs. While the Eurasian bloc engages in setting trade infrastructures and transport networks, NATO is making a general call to arms, increasing deployment of troops and military hardware in response to non-existent Russian threat, eventually proposing a disquieting scenario for another war on European soil. And what’s the EU’s stance? By the way, Europe was barely mentioned in Ufa. Anti-Russia sanctions and Western media accusations of Russia spoiling EU-Greece relations were considered no serious matter. Russia’s state VTB bank CEO A. Kostin stated that it’s the EU’s, not Russia’s concern to rescue Greece, because Europe created the problem, and it has to solve it. According to him, Greece issue might cause a 2% fall in Russia stocks, which is no worry. Indeed, worries might show up for Europeans. Many times their representatives have proven themselves to be pawns rather than allies within NATO – prone ‘to go along to get along’. Now a frontline is set right there. It stretches from insanely Russophobe-ruled Baltic states, through newly NATO-occupied Nazi-Ukraine, the ISIS-backer Turkey, and reaches up the long time undefeated and oil-rich competitors Syria and Iran. What on Earth would prevent EU authorities from allowing war span over Europe?